If you’re a fan of biscuits and cats then put on your excited hat, because there’s a new ‘Cat Cafe’ opening up in London. 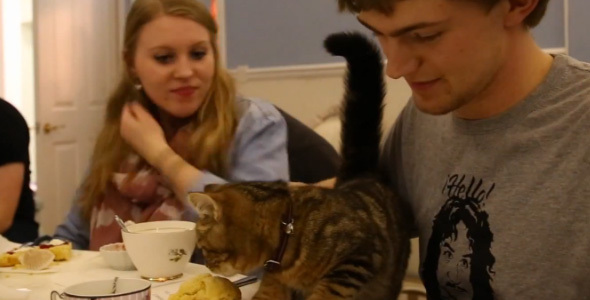 The video explains all, but it’s basically a cafe that’s chock full of cats. So you can enjoy a lovely cup of tea whilst stroking a kitty. There are loads of things in the cafe to keep the cats busy like iPads, a cat wheel (we did not know these existed) and loads of shelves to run about on. But even with all these distractions, we’d reccommend guarding your cakes and biscuits from greedy cat burglars. The cafe isn’t open yet and they haven’t announced when it will be, but it looks like it shouldn’t be too long. Check back to funkidslive.com and we’ll let you know when it’s opening. Do you want to visit the Cat Cafe? Let us know in the comment box below.